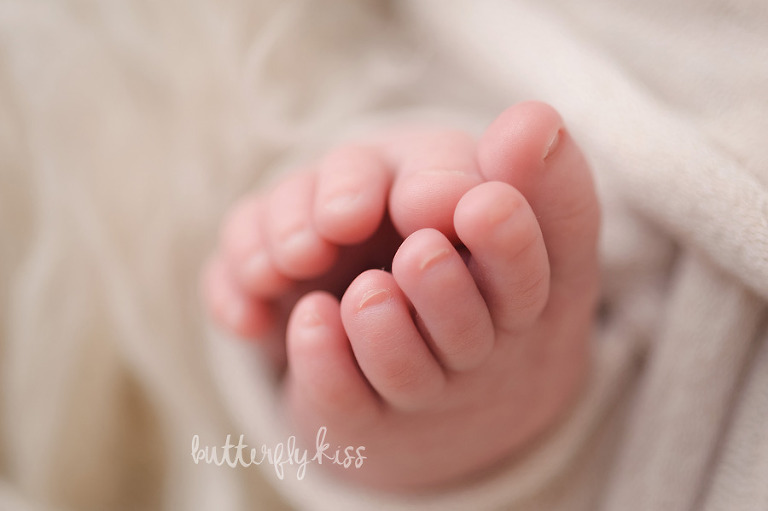 Do you love the cute newborn pose with the baby wrapped and the toes peeking out? 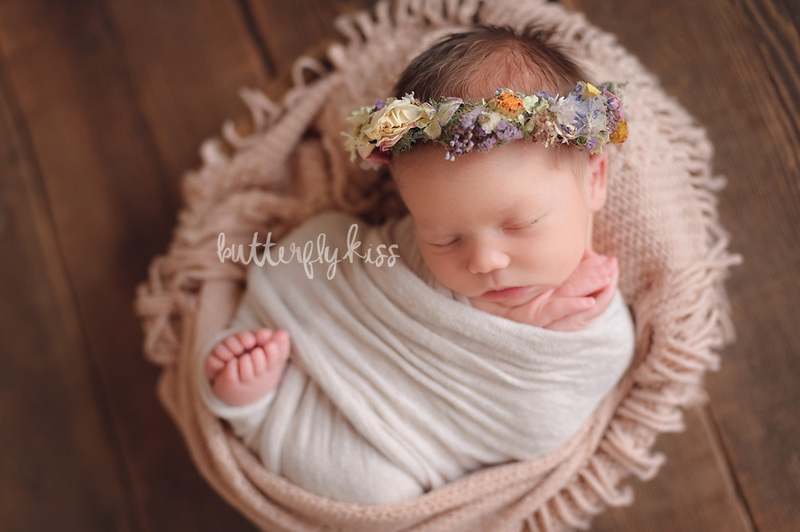 I made this newborn wrap tutorial for photographers to show you how I achieve this pose, as well as getting 3 different looks and 20 images from this one wrap! All you need is a long stretchy wrap (approximately 15×60 inches) and a few newborn baby props and accessories. Take a look at my Toes Peeking Newborn Wrap Tutorial Video to see just how to achieve this wrap first. Now let me walk you through how you can create 3 completely different looks and 20 unique images from this one wrap. First, lay baby on a soft flokati wool fur (this one is from Luneberry) and position so that the light is flowing down the face from the top of her head. 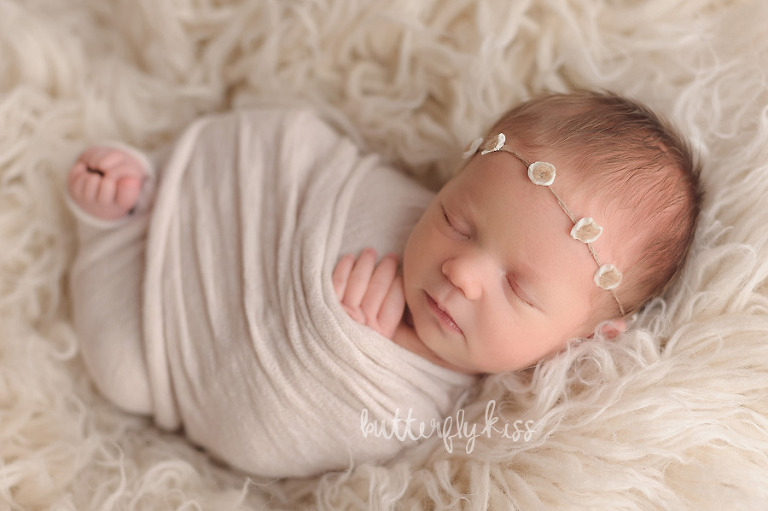 For little girls I love adding a cute headband too, like this one from Goodnightmoon Props. Make sure you get both a full length and close up of her face. Next, without re-positioning baby at all, simply rotate your posing bag 180 degrees. This will backlight your little subject for a nice variation. 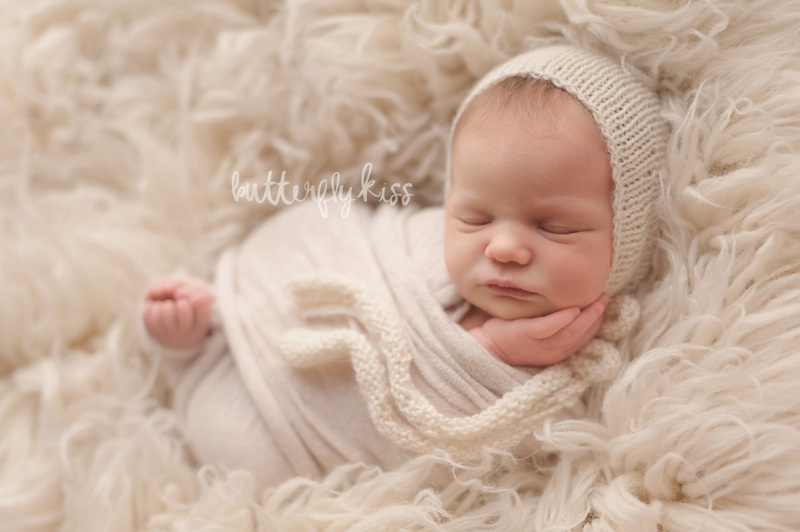 This is also a good time to switch to a soft knit newborn bonnet, like this one from Strawberry Sprinkles Photo Props. I am a sucker for the long ties which I can play with for an interesting composition. Of course, I like to call this wrap “toes peeking” so it is only right that we get a macro detail shot of the toes here too! While baby is posed on the back, it is a great opportunity to get several different macro shots in addition to the toes. Let’s move on to our second look. I have prepared a wood bowl prop on my barnwood with a soft layer (pink layer by Rozzi Rayne Studio Props) to place baby on inside. Underneath the layer I have one of my Photoblocks Props posing beans where her head is resting to elevate her face and help curl her in snug. Also notice that I have changed the position of her hands to create a different look to this pose. Top it off with a gorgeous floral crown (like this one from Olive & Elm) for a whimsical girly image. Like before, you can also rotate the prop to backlight this setup and change accessories for variety. Finally, for the 3rd look, I have moved baby from curled up in the bowl to laying “tucked in” a bed (natural cradle from Rozzi Rayne Studio Props). In this variation, you can use another layer to cover up over your wrap. This maximizes how different your image looks without actually disturbing baby much. This is a good time to loosen the top of the wrap and start pulling baby’s arms out more. 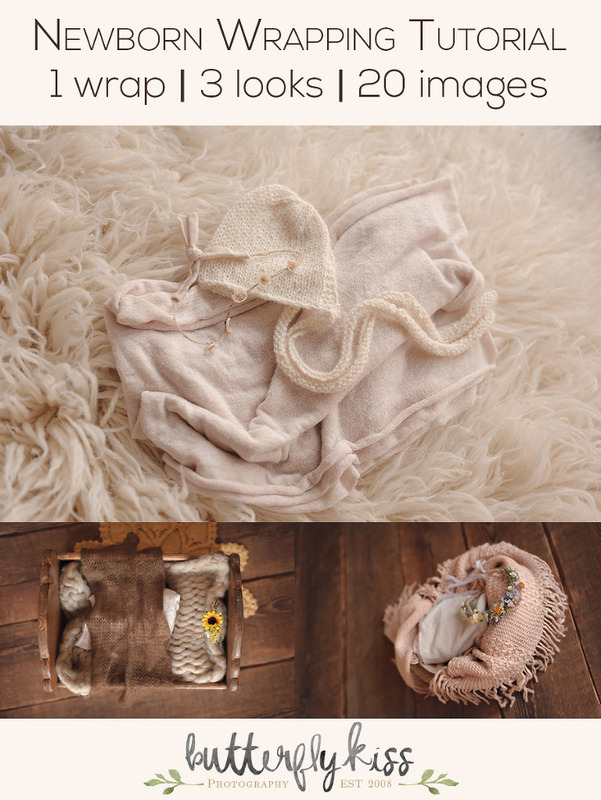 Take a look at the 20 final images from this newborn wrap tutorial. Using this wrap pose is a really great way to be efficient during your newborn sessions, create a lot of variety for your gallery, and a beautiful solution for settling an awake or fussy baby for photos. Enjoy this newborn wrap tutorial? Pin this image so you can find it later! 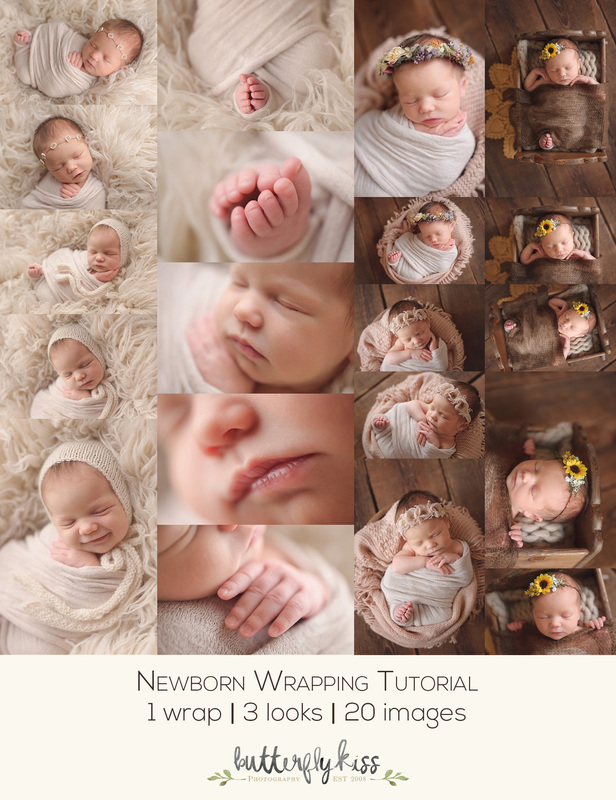 I really hope that this newborn wrap tutorial helps you in your newborn photography. I would love to know if you’ve tried this out? Please feel free to ask any questions in the comments section below, or tell me if this tutorial has helped you in any way! Please contact me to find out more about newborn photography mentoring or to book a session. You’re amazing! 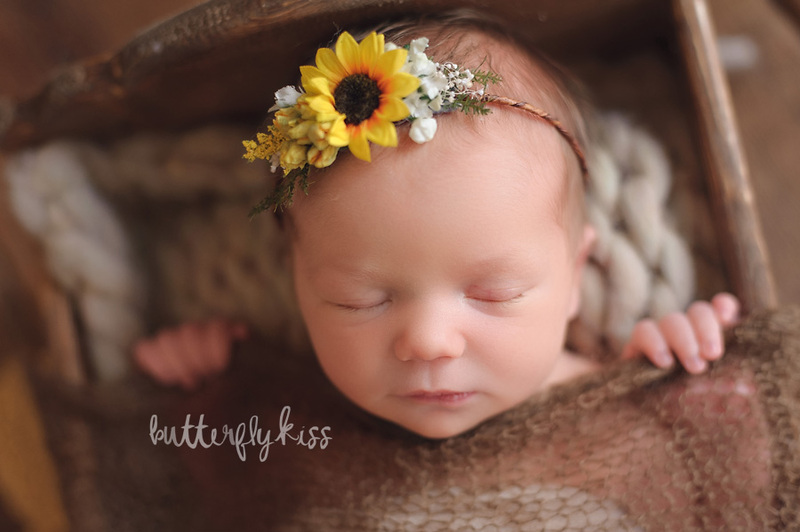 I am new to newborn photography and can’t wait to try this! Thank you so much, and I would love to see how it works for you! This is so helpful! Loved watching your video! Can’t wait to try at my session tomorrow! This is so great thank you for sharing Tami! I can’t wait to give it a shot!